Shanghai Metal Corporation (SMC) is happy to invite talented people from around the world to grow and learn with us. We offer several internships and part time jobs for undergraduate or post graduate students. Shanghai Metal Corporation offers many opportunities to enhance their academic experiences, work in a dynamic environment, and be rewarded for outstanding performance through practical work assignments. With us, you will be able to experience multicultural team work as well as showcase your individual abilities. You will be able to learn about international business and trade from a reputable company. 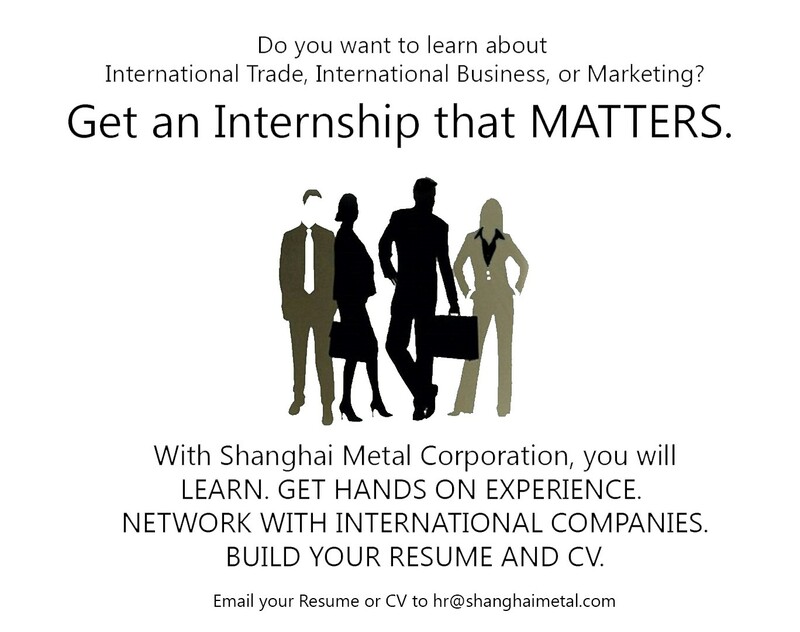 Apply now by sending us your resume or CV to our International Human Resources Manager at hr@shanghaimetal.com or internship@shanghaimetal.com, or you can directly upload your CV and details in the below register box. Please write the desired position on the title of the email. Our Human Resources Department will contact you as soon as possible. 3. Native Speaker of English or Fluent in English. 电话: 021- 68756127, 58202753, 58316326, 58207039, 58309552, 58309368, 68756021, 68760737. Please fill in the following form to contact us. All fields are required.